Life is so much more pleasant when you love going to work. Sir Roger George Moore, KBE (14 October 1927 – 23 May 2017) was an English actor. He played the British secret agent James Bond in seven feature films between 1973 and 1985. He is also known for playing Simon Templar in the television series The Saint between 1962 and 1969. I played it slightly tongue-in-cheek because I never quite believed that James Bond was a spy because everybody knew him, they all knew what he drank. He’d walk into a bar and it would always be, "Ah, Commander Bond, martini, shaken not stirred." Spies are faceless people. 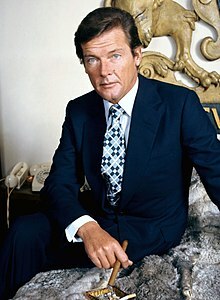 I think Roger is the best Bond, of course – not just because of being my Bond, but because if you read the early Ian Fleming books describing him, that’s how he was, he was a bachelor, unattached, he was luxurious, sophisticated, and he was not available for females so no long term relationships there. I think Roger really portrayed that. I was very sad to hear of Roger’s passing. We had an unusually long relationship, by Hollywood standards, that was filled with jokes and laughter. I will miss him. He embraced the role with an easy charm and grace that let us all in on the game. He saved the world seven times and then went on to become an even greater man working to ‘save the children’ with UNICEF. He never forgot the audience and we shall never forget him. I am proud to have followed in your footsteps Sir Roger. I am devastated to learn of Roger Moore’s passing. The first leading role I ever had as a Bond girl was such a new and frightening world and Roger held my hand and guided me through every process. He taught me about work ethic and humility. He was so funny, kind and thoughtful to everyone around him and in that Roger taught me what a movie star really was and should be. Through his lifelong work with UNICEF he showed me the true meaning of being a humanitarian and giving back. He was my Bond. He had a heart of gold, a great sense of humor and will be missed by the many people who loved him. This page was last edited on 13 December 2018, at 20:43.